The 6RL Series Programmable DC Loads recover energy back to the grid for great cost-savings. All 6RL loads share a common and intuitive user interface. The 6RL Series are highly efficient as they do not dissipate power into heat but rather recvoer most of the energy provided by the unit under test back to the utility. This saves both energy costs and HVAC cooling costs. 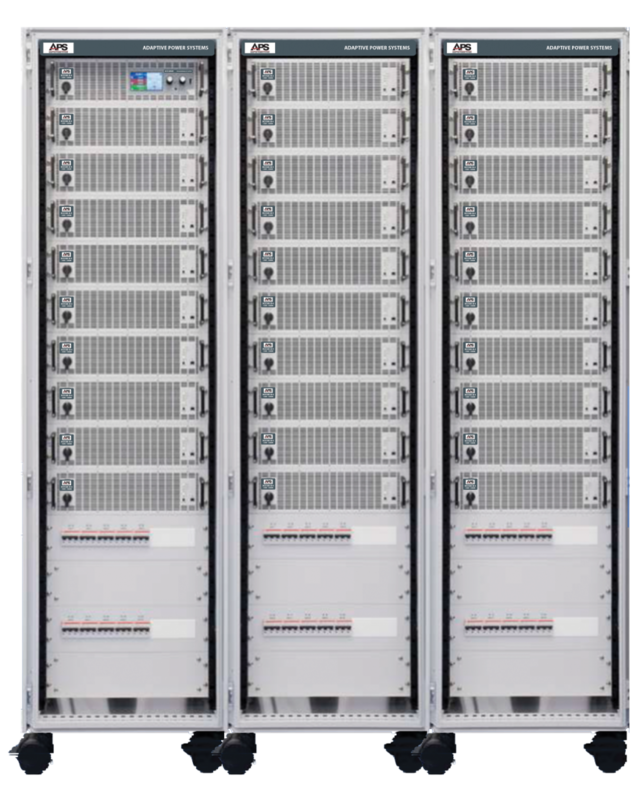 There are 30 different 6RL Series models ranging from 3.1kW to 15kW per 3U chassis. Models are available for either 208Vac or 480Vac grid connections. For higher power requirements, 6RL models can be paralleled easily. One 6RL MASTER load can be paralleled with up to 31 other 6RL DC Loads in SLAVE mode. All controls and total power and current measurement is done by the MASTER load. 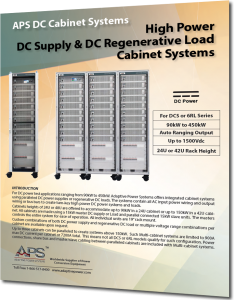 Complete cabinet systems up to 450kW Load are available. For questions regarding the 6RL Series DC Loads, please contact us. 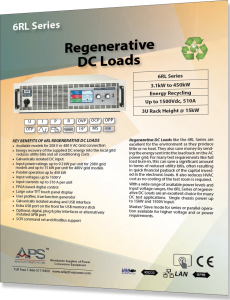 The Adaptive Power 6RL Series regenerative DC loads are intended for high power DC test and product development applications in a wide range of industries where energy efficiency and cost savings are important. The 6RL Series consists of models supporting voltages from 80Vdc to 1500Vdc and are well suited for testing large battery packs, high power AC/DC converters and energy storage systems found in Solar and Wind power applications. Their flexible V-I operating curves span range of voltage and current combinations at high power levels. All 6RL Series models are regenerative, returning 92% of the power absorbed from the unit under test back to the grid. Models for 208Vac three phase and 480Vac three phase are available. The 6RL Series consists of a total of 14 models for 208V grid connection in 3.1kW, 6.2kW or 9.3kW rating and 17 models for 480V grid connection in 5kW, 10kW or 15kW rating. All units are housed in a 3U (5.25″) 19 inch rack mount chassis. 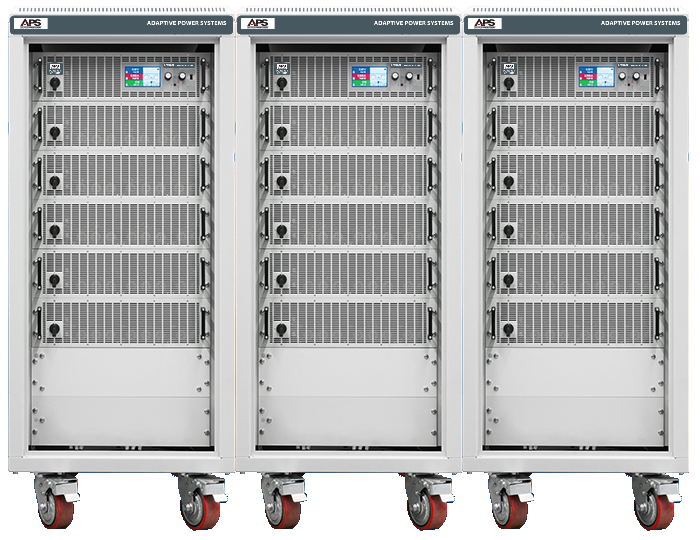 For higher power application, up to 32 DC loads can be paralleled in a MASTER/SLAVE configuration requirements up to 450kW. For power requirements higher than 15kW, refer to the high power master/slave cabinet systems. The APS 6RL Series provide near total energy recovery of power absorbed by the load during test. This saves on both utility bills for electrical power as well as cooling HVAC costs. It also allows testing of units using a much smaller grid service than would be required when using conventional resistive or electronic loads. These cost savings quickly add up to pay for the cost of the 6RL loads in no time flat. All APS 6RL Series Loads are equipped with a powerful DSP and large touch sensitive color TFT display. Simple to operate, these DC loads provide capabilities that cover a wide range of load applications. Precision metering of Voltage, Current, Power and Resistance is standard. Elaborate testing and burn-in of linear and switch mode AC/DC power supplies is made possible by flexible ranging and wide V-I operating curves found in all 6RL Series DC loads. This supports high throughput production test and burn-in of small and large AC/DC power supplies. With built-in features like over current protection (OPC) test and over power protection (OPP) test and dynamic constant current waveform testing, new power supply designs can be thoroughly evaluated against design specifications. An built-in programmable function generator allows user defined current profiles to be applied to a unit under test as well. Time sequencing of specific discharge current levels as a function of battery voltage allows characterization and performance testing of various battery chemistries. The high current resolution and accuracy of the 6RL Series loads combined with their energy recovery capabilites supports testing of large EV mobility batteries. 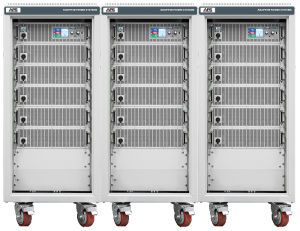 MASTER/SLAVE parallel configurations up to 480kW are available. The maximum power point tracking function of the 6RL DC loads simulate the behavior of a solar inverter allowing solar panel testing under a variety of conditions. Contact us to inquire about available instrument drivers and Windows GUI Software.